From the director of The Last King of Scotland comes The Eagle, one of the most under-rated movies to release this week. An engaging adventure about two soldiers’ quest to retrieve a lost emblem across the highlands of Rome, this film could have turned out to be a real gem, with some effort in fleshing out the characters. Nevertheless, this film is still a safe bet at the movies, so give it a try. You know a director has grabbed your attention well into his film, when you refuse to believe that a rustling behind the bushes is just a false alarm. Director Kevin McDonald successfully does that in one of the initial scenes in The Eagle and from there on, it’s an absorbing film throughout. McDonald already has a reputation as a director. He directed the Oscar winningThe Last King of Scotland besides the critically acclaimed State of Play. This time he’s tried his hand at a period drama. Based on the novel, The Eagle of The Ninth, this film is set in the year 140 AD, and tells the story of Marcus Aquila (Channing Tatum), a young Roman soldier who embarks on a quest to find his lost legion’s golden emblem, ‘the eagle’ which went missing some years ago. The emblem was defended by his father’s army - 5,000 soldiers - who are believed to have died in that conquest, after they tried to conquer British territory, outside the Roman empire. Several attempts were made to retrieve the men and the emblem they so proudly defended, but in vain. In fact, before Aquila, whoever embarked on a similar journey never returned alive. The film is a pure adventure and one that’s fraught with challenges of trust, endurance, hunger and survival from the enemy of tribals. Aquila, is joined by a Brit, Esca (Jamie Bell) who despite being a prisoner of war, is sworn to loyalty as a slave. I loved this contrast between the two characters - the Roman Aquila takes the help of his enemy, a Brit (Esca) to find an emblem that matters only to the Romans. Esca’s characterisation is wonderful and it shows remarkable colours during their journey together, often surprising us and convincing us that humanity always triumphs over evil. I’d have liked it if Aquila’s character had been fleshed out a little better - what makes him so passionate about retrieving the legion? What was his life like after his father disappeared in that infamous incident and how did he train to be so strong? Some history to how Esca became a slave amongst the Romans would also have added some meat to the screenplay, especially during their journey together. Stories which are about the search for something precious, something that was lost and retrieved, must build enough cause into the conquest. For example, why is the Eagle emblem so important? Why does the honour of the empire matter so much? The result is a very flat, wooden story of two men searching for something and an army determined not to let them have it. It’s entertaining alright, and their journey is very watchable. What wrecks me is that this could have turned out from being merely a good film, to a really good film, with just a little more effort. The action scenes, the slow-mo are well-choreographed. Tatum looks a lot like Owen Wilson (without the broken nose) and I felt he’s a bit wooden throughout the film. 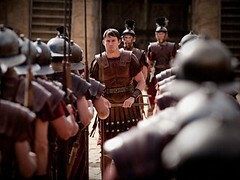 If there’s one thing I’d change about this film, it would be Tatum - he seems like the wrong choice for the lead role. Costume dramas have this ability to transport you into a different world. This film tries to, but right from the first shot, there seems something odd. I wondered whether the actors were doing a dress rehearsal, because the actors’ dialogues do not have an ancient stamp about them. Also, after being on the road for so many days, how come Aquila and Esca don’t grow a beard? It’s what I call, ‘typos’ in a film. Despite these drawbacks, The Eagle is still worth a visit. It may not register as a movie you’d remember for a long time, but it is engaging in a good way, while it lasts. Concept: How far would you go to resurrect your clan’s honour?